To keep your hearing aids working correctly for years to come, you’ll want to learn about proper care and maintenance. And while it may seem like an additional burden, with the right process your hearing aid care will come to be easy and automatic. The secret is building effective habits. If you integrate your hearing aid care into your everyday and nightly routines, pretty soon it won’t feel like any extra work at all. Clean your hearing aids daily – Attempt to include your hearing aid cleaning into your nightly routine, so it becomes as automatic as brushing your teeth. Daily cleaning is essential because daily hearing aid cleaning can prevent the build-up of earwax, dirt, and dust into the various components of the hearing aid, which can result in distorted sound with time. You’ll want to clean your hearing aid with a smooth, dry cloth, while averting any kind of fluids that can ruin the hearing aid electronics. Consult your hearing professional for special instructions on cleaning each style of hearing aid. You may also want to consider investing in a hearing aid sanitizer, which utilizes ultraviolet light to safely and thoroughly kill harmful pathogens. Hearing aid cleaning kits are also obtainable with all of the instruments you’ll require to safely and securely clean the device without damaging the electronics. Always check the batteries – Hearing aid batteries should always be examined and replaced regularly to ensure top hearing aid functionality. Consider using a battery tester in the morning to assure you have sufficient power for the remainder of the day, and carry an extra set of batteries with you. Before bedtime, when your hearing aids are not being used, turn them off and store them in a cool, dry spot with the battery door open. Keep the hearing aids away from moisture. This means that storing your hearing aids in the bathroom is probably a bad idea. 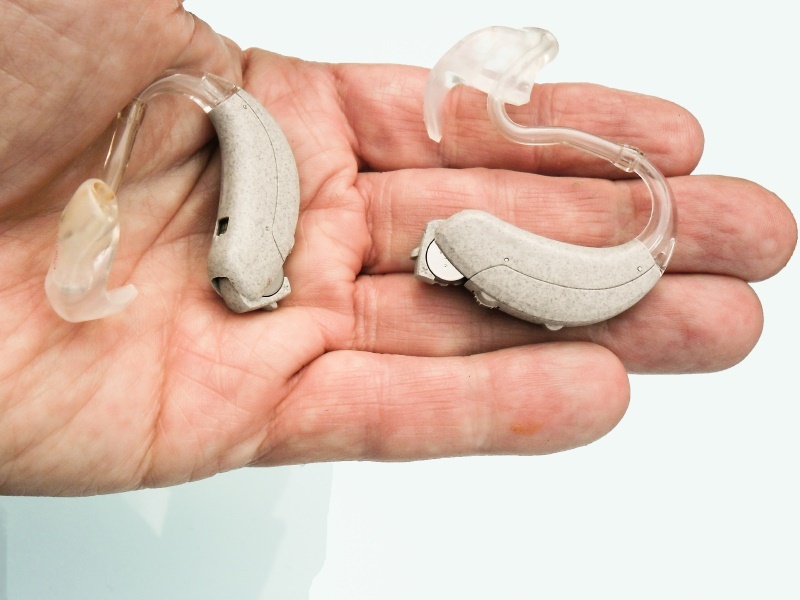 Try to avoid subjecting the hearing aids—and hearing aid batteries—to extremes in temperature. You’ll want to store your hearing aids in a cool, dry place. Avoid storing your hearing aids out in the open, where they can become damaged. We suggest keeping your hearing aids in a container or drying kit inside the drawer of a bedroom side-table. This will safeguard the hearing aids from dampness, temperature extremes, and damage from being knocked off the table. In addition, make sure to take out your hearing aids before taking a shower, swimming, or using a hair dryer or hair spray. Maintain ear hygiene – While earwax has several advantageous characteristics, including protection and lubrication of the ear canal, it can cause severe damage to your hearing aids. As it gets wedged within the hearing aid components, sound can become distorted. Ensure that you’re maintaining appropriate ear hygiene, and if you have too much earwax, think about scheduling a consultation with a professional. Carefully insert your hearing aids – While putting in your hearing aids, lean over a table or soft surface in case the hearing aids fall. Hearing aids come with vulnerable electronics, so a fall on a hard surface can produce significant damage. Even with meticulous cleaning and maintenance, over time the hearing aid will call for more complete cleaning or repair. To ensure that you continue to receive the best sound possible, we recommend getting your hearing aids professionally cleaned by a hearing professional a minimum of two times per year. Hearing care professionals will provide you with a deep cleaning, a tune-up, and will sometimes replace parts. Staying on top of this regular maintenance will expand the life of your hearing aids and will ensure that you get the best sound.